The accomdation my wife and I booked on our honeymoon to Mexico made our entire holiday even more perfect and gave us the comfort to enjoy the beach, do tours and enjoy everything this beautiful country has to offer. We stayed at the 5 star Valentin Imperial Maya Resort in Playa del Carmen, a great all inclusive hotel which also has an adults only policy. This policy was great for us as we were looking for a romantic honeymoon location and accomodation which obviously is different from a family resort or hotel. 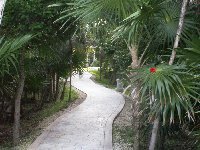 The Valentin Imperial Maya Resort had everything we could have asked for from the nice room and refreshing pool to a wide range of shops, international restaurants and bars. Being right on the beach it was so relaxing to be able to walk there in the morning and look out over Playa del Secreto. The resort was just a half an hour drive from Cancun Airport and if we wanted we could go on day trips to the Maya sites nearby like the one we visited in Tulum or Coba. A perfect honeymoon in Playa del Carmen and definitely a beautiful resort to return to. Did you enjoy Valentin All In Resort Playa del Carmen and have you been on a holiday in Playa del Carmen, Mexico? Where to stay in Playa del Carmen: Valentin Imperial Maya Resort in Playa del Carmen. What to do in Playa del Carmen: Relax on Secreto Beach and visit the various Maya sites. Where to eat in Playa del Carmen: The resort had 6 international restaurants plus great breakfast and lunch menu's.